“DXing Adventures In Egmont Park – the Story of a DXpedition to ‘Hump’, Pouakai Range” by Robert Krijger, New Plymouth. After seeing a technical article in the NZ DX Times by Peter Chambers on Radial Wire antennas, my latent interest in MW DX was brought back to life. One of the reasons my interest is only latent is the chronic noise problems and inherent lack of space one has in the suburbs. So this item talks of very effective pickup on only 100 metres of wire. Sounds very practical to go away somewhere and set up for the night without too much fuss. 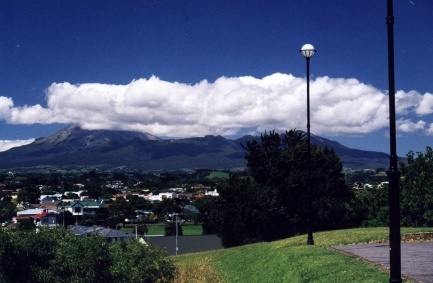 For DXers in my part of the country Peter suggests Stratford Plateau on the eastern side of Mt Taranaki at an altitude of around 1100m as a good site to try. I thought I would go one better than that. As a keen tramper, I thought I would pack up the radio gear and go bush. My younger brother Bryan, also a keen tramper, came along too (to carry the tent!). Our destination was to be a peak on the Pouakai Range, in the Egmont National Park, called “Hump”, at an altitude of around 1300m. After some shopping for various items, and on receipt of my ‘Equinox’ balun ordered from Paul Ormandy, I was ready to go. The track we were going to take (like most of the bush tracks in the Egmont National Park) the Mangorei Track, can be fairly boggy, so generally needs several days drying out after a good rain for comfortable walking. So part of picking a good weekend to head up was dictated by the weather over the previous week. First targeted weekend was 20-21 of November, after a reasonably fine spell of weather. Tuned into Augie Auer on National Radio after the 3 p.m. news on the 17th for his fortnightly weather slot, “Not so good” was his verdict for the weekend, with a “cold air flow aloft” causing some instability and thunderstorms activity. Not good for MW DX so the focus turned to the following weekend. (For the record, a strong cold southeast wind did come through, bringing snow to 1500m on Mt Taranaki, but remained clear on Pouakai, (yes… but reception was awesome-!). QRN at home on Saturday night was also rather high. November 27th, election day, weather a little dodgy but still sunny and 20 degrees when we set out on the 20 minute drive to the start of the Mangorei Track, after completing our democratic obligations. The forecast suggested the odd heavy shower, but a wind-change to the southeast, bringing improving conditions. Loaded up with about 35kg of gear between us, we set out under overcast skies into the bush for the 6km trek to “Hump”. At about 800m altitude mark, we walked into the cloud. The odd brief shower was encountered on the upper part of the track, nothing of concern. 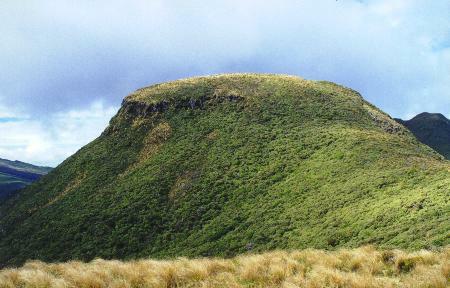 It was a relief after 2 hours to see the Pouakai Hut, a chance to rest aching shoulders and back, before setting out for the final difficult slog up through steep scrub on the side of “Hump”. A howling northerly greeted us as we reached our destination and walked over to our predetermined camp-site. Very quickly we set about the difficult task of raising the tent in an 80kmh gale, before the weather inevitably broke. Then it was onto the aerials, 2 x 100 metre radials, one at 20º (the wind caught what was intended to be 15º), and the other at 45º. Straight into the wind and now rain, through scrub and tussock I ran out of clear ground at the far end. I could barely move my fingers from the numbing wind-chill by the time I returned to the shelter of a very inviting tent. Just the earth to put in now. By this time it was pelting down. Every time I tried to knock the earth-stake in I hit rock at around 30cm. Well, that would have to do! The ground after all was, or soon would be, saturated with good conductivity. Now, the rewards for all that effort. I plugged my IC-R70 into my 12v cordless drill battery, connected the antenna and earth, and switched on. It was about 5 p.m. by his time, still a bit early for any DX, bit I could at least get an idea of what the aerial was doing. Early indications where of some concern. Big signals from the north, which I expected, but even bigger signals from the south, including Christchurch. I wasn’t about to go back in the weather to experiment with things so I switched the radio off to save on batteries and set about the more important task of cooking a feed. That done, it was time to have another look on the radio. Would it all be worth it? Of concern was the late fade-in time, with the first het on 1580 noted at 7:30 p.m. (0630z) but at least there was absolutely no noise, as was to be expected at this height. That is, no r.f. noise but boy! the rain and wind on the tent created a racket!. Due to space limitations I was unable to pack headphones so hearing the radio was difficult at times. By the time the battery had given up the ghost, it had become apparent that DX was as slow as the election results. Whether it was the site, or setup, or propagation on the night, I don’t know. Only Hawaii and a handful of stronger North American stations made it through, at levels lower than I have experienced at home. The lack of noise however enable reception of at least one signal on the X-band, something impossible at home on current set-up. First light, and one has to answer the call of nature. Rain has virtually stopped, just as misty drizzle and the wind, which had changed to a south east gale overnight (knocking the tent around which had been pitched for a northerly) had eased considerably. 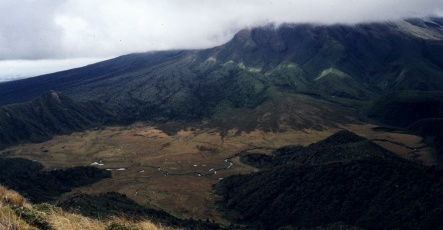 A glance over the swamp 200m below, towards Mt Taranaki, less than 2km away, saw newly white slopes beneath the cloud base. Once again, there was a dusting to 1500m. One positive to come out of this trip was the performance of our tent on it’s first outing. It survived some very testing conditions and was very warm inside. The trip down was uneventful if somewhat tedious on a rather damp track – over 100mm of rain fell overnight at New Plymouth airport, and 200mm at North Egmont (the wettest spot in New Zealand for the second year running).